With a different configurations available to suit the operational needs of small and large businesses, Dexion HI280 Tyre Storage systems provide high capacity tyre storage without harming the quality of the tyres stored, whatever the location or requirements. Dexion HI280 Tyre Storage systems are designed to enable maximum tyre storage within any available space while maintaining the quality of the tyres stored. 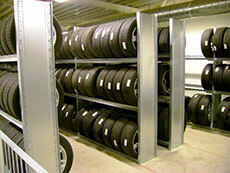 Providing organised, adaptable, easy to access and simply operated systems that are suitable for use throughout the entire year, HI280 can be installed as a smaller shelving system for local independent tyre outlets and garages or as a mobile system for large scale tyre manufacturers. In Vertical tyre storage systems, HI280 is installed with medium span bays to allow increased storage capacity and access. Tyres are stored upright within the system and tyre brackets are used to keep them in place and avoid point loads or flat spots on tyres to ensure tyre quality is not impaired. Fully adaptable to requirements, with shelf heights easy to change according to the size of tyres stored, the system offers easy manual handing and is suitable for smaller scale operations. With HI280 Mobile Tyre Storage, the HI280 medium span frames are installed on mobile bases to improve the storage capacity of the system and allow extra security options, including lockable aisles to limit access. The system can be installed as a manually or electronically operated system, both offering easy access. To find out more about installations of HI280 or other Dexion Tyre storage systems you can download a brochure, or call us now on 0800 083 0953 to speak to one of our experienced sales team.